Oldhammer Forum • View topic - Retro video games? I love retro video games. In fact they're the only video games I play. My favourites are Prince of Persia (original), Golden Axe and the LucasArts Adventure Game collection -- The Secret of Monkey Island etc. I don't really play computer games much these days, preferring board games and tabletop war games, but if I do venture back into computers it's nearly always a 90s-era classic. atari vcs i loved combat, adventure, jungle-hunt, pitfall and enduro. for flight games, wing commander, evasive action and us navy fighters were my faves. I remember gleefully drowning people in populous 2 for many hours. laser squad, and ufo were great for turn base. command and conquer made real-time for me, syndicate was so very quick/ point click at the time I preferred cannon fodder. I'm a fan of retro video games but also buy new games. I mainly collect videogames for consoles, not pc games but this month I started play to the Maldita Castilla game. 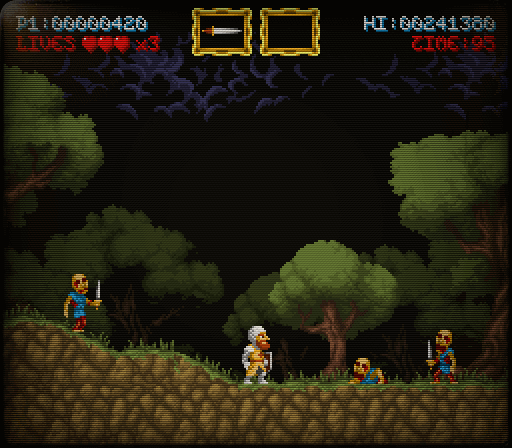 It's a free indie game for Windows with appearance retro. My first videogame system was a master system with Hang on and Safari hunt inside and it still works . Just played some Golden Axe yesterday! Whenever I see my brother, we break out the old Genesis or SNES. I know it's not "that" retro, but has anyone ever played "Little Fighter"? I played this & the second one of this game to death . Last edited by Stormbringer on Thu Mar 22, 2018 10:59 am, edited 1 time in total.